Description: While at the 2017 New York City Drone Film Festival Tyler Mason catches up with drone filmmaker Jay Worsley, who's short film titled "Perspective" was honored as an official selection. 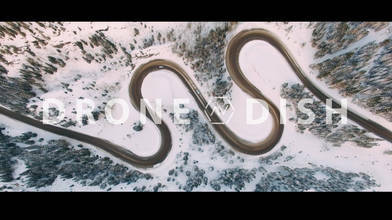 Hear Jay's philosophy on how aerial shots can enhance the art of filmmaking as well a cautionary tale of his own experience flying in a National Park on this episode of the Drone Dish! You can check out Jay's profile by clicking HERE. And for more amazing aerial views, check out AirVūz.com VIDEO TRANSCRIPT: Interviewer:	On another special edition of The Drone Dish, we catch-up with Jay Worsley, a filmmaker, who uses his drone to capture beautiful landscapes throughout the United States. Well Jay, thank you for joining us here at the Day of Drones, on The Drone Dish. Jay Worsley:	Yeah, I'm excited, this is pretty awesome, pretty insane. Interviewer:	Well first of all, congratulations on having your film selected in the New York City Drone Film Festival. Perspective was in the landscape category. Tell me a little bit about that film, what went into it, and kinda what the idea was behind it. Jay Worsley:	[00:00:30] So, I've been working on a bunch of different projects, and there were commercial projects or some independent film projects and I had the opportunity to go to all these different cool locations and of course, you know, a lot of filmmakers have drones now, so I had a drone, and I'm like ah, I'm gonna get some cool aerial shots. So, I had all this just incredible aerial footage that I'm like, I got to do something with it. So, I said I'm gonna put together a show reel. And, I started piecing it [00:01:00] together and I'm like, you know what, this show reel is kinda turning into its own little film on its own, so that's what Perspective turned into. It turned in from a show reel to this whole idea of being able to see different landscapes from different perspectives at different times of the year. So, there's some summer in there, there's some winter in there, there's dessert, there's forest. And, I just really like the idea of people kinda getting out of their, getting away from their desks, getting out of their shell, [00:01:30] and being able to see the forest that they see all the time, but seeing it from a different angle and a different perspective cause it gives you a different feeling, different emotion, just by kinda just changing how you view it. Interviewer:	I know you've been, as a filmmaker, have been involved in some other film festivals. Is this your first drone specific film festival? Jay Worsley:	It's not my first drone specific festival. I would say, I probably shouldn't say this but, I'd say it's the most legitimate drone festival. There's a lot of film festivals out there, that they're really [00:02:00] great, they'll either approach different filmmakers to submit just so they can have content. And, so I've been a part of some of those festivals, but then this one, I just, it was a crap shoot. I'm like, I'm just gonna submit, pay the submission fee, hope for the best and when I got the email, I was so surprised and I saw the competition and, I'm like, man, I don't know why I'm in this, but I'm excited to be in this. Interviewer:	Well, yeah, you're video's on Airvuz so those people watching should check it out, it's pretty cool. Jay Worsley:	Thank you. Interviewer:	Another one [00:02:30] of your films, A Fleeting Dream, you talked about the use of natural sound and how important that was to you. Why was that important to include that in that particular film? Jay Worsley:	Well, for me with Perspective, that is one thing I wish I did do, was put ambient sound in it, because I feel that, that really brings the viewer in. What makes the difference between a music video and a film? I think that's a one really big part of it, is bringing that viewer in to feel like their there. So, if you're watching the video of the ocean and you hear the waves, you hear the wind, [00:03:00] you're just gonna, it's just gonna kinda really engage all of your senses, as opposed to just seeing something. Cause I think films are not just all visual, they're also audible too in order to really tell that story. Interviewer:	We were talking beforehand, you had another, a learning experience I guess you could call it with a National Park. I know you were, you said you kinda learned from that. Any advice to fellow drone pilots out there based on your experience? Jay Worsley:	Yeah. So, don't be cocky and arrogant, and if you know the rules, [00:03:30] or if you know the laws, follow the laws. You can break the rules, but just follow the laws. Because, I was in a National Park in Arizona called Petrified Forest and I was droning there, and I got caught and it was a $500 fine and I got my drone taken away and had to get it back after paying it, and it's just not worth it. Cause if I get caught again, obviously, I would get in more trouble. So, like I said, it's no problem to break the rules. Rules are meant to be broken, but laws are not meant to be broken. [00:04:00] I just wouldn't risk it, it's not worth it. Interviewer:	On your website, jay worsley dot com you mention the insane amount of beauty in our world. How do you think drone's have kinda helped really showcase that and kinda elevate that to a new level? Jay Worsley:	I feel like Perspective kinda touches on that, because it's just like I said, if I'm looking at you right now and if I come over here, you look a lot different cause of the shadows on your face, but if I come over here, you're face is lit up, so... Interviewer:	That's my good side. Jay Worsley:	Yeah, that's your good [00:04:30] side, right? This is my good side too. So, just by changing the angle I have a completely different feeling and emotion of how I'm looking at you. So, I feel like with drones, they kind of are able to get so many different angles that we wouldn't get before. So, like I said, seeing that forest that everybody's been in. There's a forest in Flagstaff that's in Perspective that I've been to a ton of times, but I had no idea just how it looked when I was 200 feet in the air. Being able to see so much more of it. Being able to see how the mountains [00:05:00] are carved through the trees, and all that kind of stuff. And, it's just really cool to be able to see all these different angles of what I've already seen. And it makes it new and fresh to me. Interviewer:	Jay, we appreciate you joining us on The Drone Dish and congratulations again. Jay Worsley:	Thank you. Appreciate it.